On a warm summer’s night in the middle of the Saharan desert, a lion with its cub strolling along the long and golden grass. Was teaching it’s cub the art of survival, the art of hunting; How a lion fends for it self. How to pounce, and be a ‘lion’. 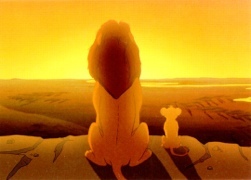 It was mufasa (from disney’s classic animated movie ‘The Lion King’), out with his son, simba, on a hunting lesson. Who said the now widely used phrase. “The-circle-of-life”. Both whilst laying on their backs looking up at the night sky, were deep in thought and dazzled by the splendour of the night’s sky. When simba being the novice out of the two, asks his father “where do all the dead lions go, father?” To which the mufasa replies “son, after death the spirits of the lion(s) ascend the heavens from which they then become part these sparkling stars you see now”. Having heard this, and after a brief silence of thought, simba then asks his father “will you be joining them aswell?” “yes my son, when my time comes, this is the circle of life. New one comes and the old ones go” was the reply. i was able to relate to. This scene had a profound impact on me. Something in later years I would still be able to draw back to. Now growing over the years and seeing many things in life one of which is living through seeing my uncles & cousins getting married. Then eventually settling down with their own families. Recaptured the essence of what I heard many years ago. This message was brought home a little more closer recently, when both of my brothers got married. I was able to depict the remaining phases of their life. They too, like my mother & father would now go through what they went through. Soon, settling down with their own families, seeing their children grow. Eventually, getting them married and seeing them re-live the life once they lived. Whilst they move on to becoming a grand mother/father. With our parents becoming “great grand mother/father”. It is amazing to see how the nizam (system) of Allah ajawajal is running, how he operates & how this system of life has been running since time began. We live the life that our parents lived, and they live the lives that their parents lived. This is why it is paramount that we leave a positive lasting impression on our children and generations to come. Our footprint of life is our children themselves! A sign of the end of times is that this is reversed, when a negative lasting impression is left. Where the ‘new’ grow up to despise the ‘old’. “A look into history is not how the ancient lived. But, rather how we lived several thousand years ago”. SubhanAllah, it really is beyond words, something fascinating to ponder and to see the circle of life plowing through the field of time. Something which will eventually end. As it is destined to. When all the harvested crops will have been gathered and the field of time no longer needing to be used! The message of the circle-of-life and it’s heavenly appeal has a penetrating impulse within me. Although as believers we do not believe the later part of what mufasa said. – The spirits becoming stars, it still nonetheless is, a powerful tool to keep at the back of ones mind. Allowing you to always visualise & contemplate how one day like the thousands before us, we too will meet that appointed day! – The day in which the circle-of-life for us, ends. “… New ones come and the old ones go …”, out with the old and in with the new.